On any given day, my house looks like a war zone. I like to have a neat and tidy house. However, with two kids - a stubborn 3 year old and a curious almost 1 year old - it's hard to keep things clean and organized. As much as I'd like anyways. I admit defeat most days. 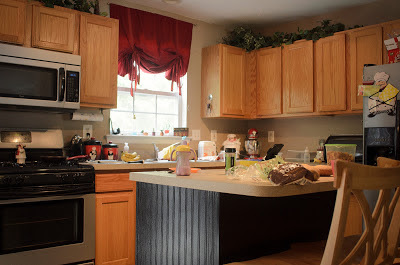 When I'm feeling like a domestic failure, I turn to the one area of my home that is always, neat, organized, and can't be touched by the children and even my husband - my computer. I've been asked numerous times how to go about storing your files. Back in the "olden days", pictures and negatives were stored in albums or maybe in acid-free boxes under the bed. In the digital age where pictures sometimes never get printed, they just sit on the hard drive of your computer. Do you "pull a Monica" and cross reference them by date and subject in some kind of database? Organize them by year? By subject? In this two part series, I'll first tackle how I find it best to organize the endless number of personal photos that I take. I keep my personal files completely separate from my client images. When you work from home, this is about as separate as personal and work gets. I upload my camera card every so often or when I'm wanting to blog the pictures on my personal blog or I'm downloading client images. I put everything into one big folder on my desktop and organize from there. I sift through the pictures the delete the ones I'll never use or that just didn't work. There's no point in taking up very valuable hard drive space with bum images. I organize my folders by Holidays, Events, Subject Matter, or child. I add the year for each event when they start to double so I can distinguish between each same event. If I have a lot of pictures of an event, I'll create a specific folder vs. lumping it into "Summer 2013". For example, I chronicled my semi-failed attempts at growing a garden all summer for my personal blog. I kept taking pictures throughout the summer, so I accumulated quite a bit. Too many for my Summer 2013 folder, which is where single odds and ends pictures usually end up. I create one of these each season for pictures that don't really warrant their own folder. Why events and not yearly folders? Well, given how many images I take - and that you probably take - can you imaging finding birthday images in an entire years worth of pictures? Or when you went strawberry picking? Or your little one wore that sock on his hand for 3 hours? That's a lot of sorting... Events help narrow down your search and years help distinguish time frames. It's a more or less situation - the more you "root" your pictures, the less searching you have to do. When it comes to my kids, they're pretty much all I take pictures of. 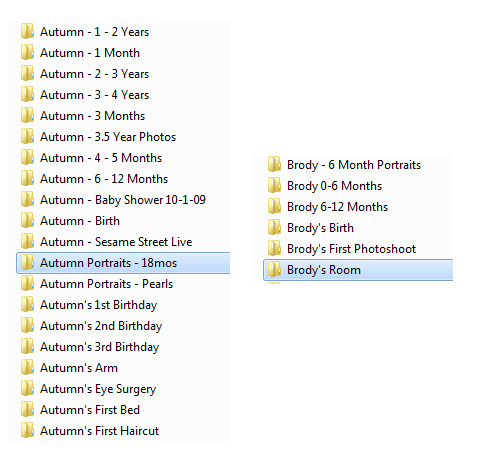 I can't just make an "Autumn folder" or I'll never find anything as she gets older and I add more pictures. Major events are stored under her name (like her eye surgery, birthdays, mini portrait sessions) and the remaining images are stored under a time period. Hm. Does anyone else notice a severe case of "2nd Child Syndrome" going on?? Eeep. So, there you have it. 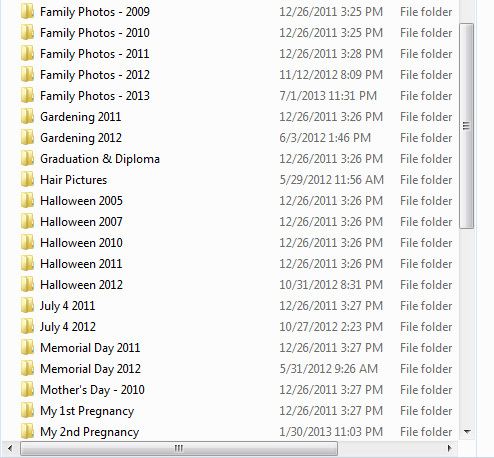 That's how you'll find all of my pictures organized on my personal hard drive. I love my system. It works for me, and it's important to find a system that works for you. I find this the easiest and fastest way to find pictures when I'm blogging or creating end of the year books. These pictures mean everything to me, so I try to take great care with them. Almost a year ago I thought I'd lost all of my pictures - client images included - and it almost devastated me. I now backup all of my hard drives using Backblaze and I'm sure to print my pictures and make my "end of the year" Shutterfly books often.